Ms. Sinema’s victory over Martha McSally, a Republican congresswoman and former Air Force pilot, marks the first Democratic triumph since 1976in a battle for an open Senate seat in Arizona. Ms. Sinema takes the seat being vacated by Jeff Flake, a Republican who retired after publicly clashing with President Trump. 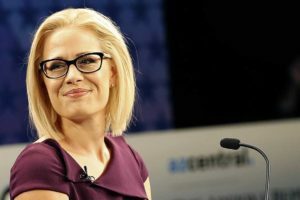 Ms. Sinema’s victory guarantees the Democrats at least 47 Senate seats. Republicans control 51, with two still undecided: Florida, where there is a recount, and Mississippi, where there is a runoff. This is more bad news for Colorado Sen. Cory Gardner, who chaired the National Republican Senatorial Committee (NRSC) for the 2018 cycle. Gardner and the NRSC have taken a lot of criticism over the past few days for alleging — without any evidence whatsoever — that Arizona Democrats were somehow conspiring to “steal” this seat from Republicans. There are still two undecided Senate races in Florida and Mississippi. The latter will be decided in a runoff election on Nov. 27 (for retiring Sen. Thad Cochran’s seat), while Florida is in the middle of a recount. If just one of those races are won by a Democrat, Gardner and the Republicans will have failed to gain a single seat despite beginning the 2018 cycle with one of the most favorable Senate maps in decades. That’s not a conversation Gardner wants to have with donors as he starts hitting them up to support his own re-election in 2020. When Cory Gardner took over the NRSC, the balance was 52 – 48. He managed to lead the Republicans as they lost the Alabama (!!) seat to make it a 51-49 margin. After the 2018 general election, the best he can hope for is a 53-47 margin — and many of the 11 victories will be by substantially smaller margins than the previous Senate contests in those same states. Should be interesting to read post-mortems and judgments on performance in recruiting, fundraising and spending. I'm not certain Cory will be considered as living up to the promise expected when he took the job. It will look exactly like the last two critical reviews on Republican performance: right message, wrong messengers – and careful to avoid Trump as one of those wrong messengers. The message is just as bad as the messengers and we need to message better to drive that point home. Regarding GOP efforts to invalidate votes in FL and GA, the chant should be: “Count every vote, or don’t collect taxes!” Government can’t operate without voluntary compliance with tax laws. The more we head toward an authoritarian state, the more that the government should be concerned with a tax evasion backlash.